Our Brioche buns are baked before the sunrises and delivered while the morning dew still shines. While you are grinding your morning coffee, Otto’s Artisan Meats in Luxemburg, is busy grinding our custom blend of 100% Wisconsin raised beef. Cheese…well that’s pretty obvious. Laacks of Wisconsin sources only the best cheese, that we hand select to melt on that burger in your hands. That refreshing glass of beer is the result of the hard working brew dogs across Wisconsin and the nation. All of the hard work and dedication that it takes to create and complete these crafts is passed along to each and every one of our guests. Our staff continues this passion to ensure that when you leave the Brickhouse, you are 100% satisfied with our food, beverage, and service. This is your community, your neighbors, and your destination for craft burgers and brews. Grant St. and 5th St. 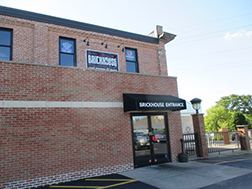 Brick House Craft Burgers & Brews Is located in West De Pere. The bar restaurant is very large with an upper second floor for extra dining and they also have a considerable sized outside patio. The interior has exposed red brick walls, hardwood floors, vaulted exposed ceilings and the walls are painted with a grey blue color. 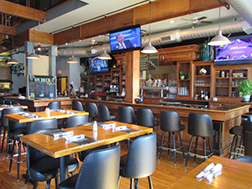 There are expansive massive windows towards the front and sides of the room and a large bar with many televisions hanging overhead. Brick House is very clean with many large booths and tables for dining. I stopped in for lunch and as soon as I entered the bartender greeted me right away she was very friendly and let me know that I could seat myself anywhere. My server came right away and gave me their menu and took my beverage order. I decided to order their Brick House burger on the servers recommendation. The burger comes with fries and I asked if I could substitute for a cup of their Thai coconut soup and she said that would okay. The Brick House burger cost $9.00 and was described as a burger on a brioche bun with cheddar, Gouda cheese, bacon, lettuce with chipotle mayo. The Thai coconut soup consisted of beer marinated chicken, coconut milk, noodles My food was served and looked wonderfully mouthwatering good. My burger was huge and was cooked perfectly as I specified, I was surprised that their were two large hamburger patties because it did not state that on the description. The sandwich was scrumptious and I loved the brioche bun, the cheeses were melted and added with the chipotle mayo gave it just the right zing to pull it all together. The chicken Thai soup tasted strongly of added white sugar which totally wrecked the flavor. Brick House has a not your usual run the mill bar menu and also offers a huge selection of craft beers to choose from.